You can’t go far wrong with a college scarf to keep you warm when the temperatures drop (like now), but if you want one with a twist, have a look at the Paul Smith reversible college scarf. 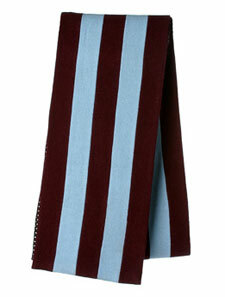 On one side, it’s a traditional college scarf, in a choice of three colour schemes, all striped and made of wool. However, the reverse is a rather smart silk polka dot design, which might pass for a vintage Tootal scarf at a distance. So that’s two scarves for the price of one – and that price is £80. I’ve always been under the impression that the silk side is there to prevent you from getting lint and fluff on your shirt and suit jacket.